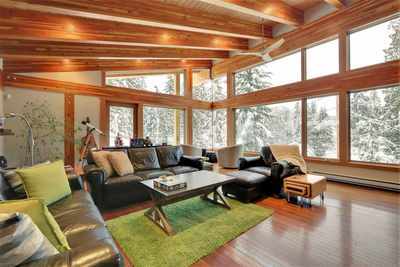 Here’s your opportunity to own a piece of paradise in Whistler. Build in 2009 and set in an elevated position, this Wexler designed west-coast contemporary home is a modern post & beam masterpiece. The spacious main floor offers an open concept living, dining room and kitchen with high vaulted ceilings, perfect for entertaining, and large south-east facing windows take full advantage of the daylight to provide a bright and airy space. If you enjoy relaxing outside, the choice is yours; a large sundeck at the front of the house gives great morning sun and valley views to the south or choose to surround yourself in the peaceful sanctuary of a private forest setting on the deck at the back of the residence. Hiking and biking trails are also easily accessed from the rear of the property.